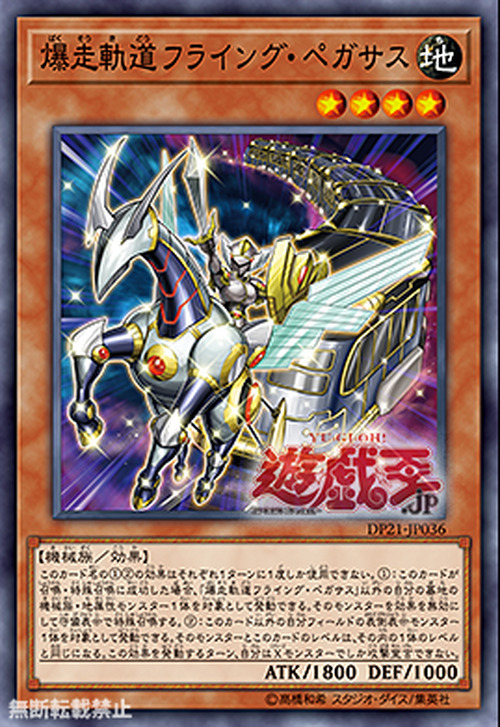 If this card is Normal or Special Summoned: You can target 1 EARTH Machine monster in your GY, except "Flying Pegasus Railroad Stampede"; Special Summon it in Defense Position, but its effects are negated. You can target 1 other face-up monster you control; the Levels of both that monster and this card become the same as the current Level of 1 of them. You cannot declare attacks the turn you activate this effect, except with Xyz Monsters. You can only use each effect of "Flying Pegasus Railroad Stampede" once per turn. This monster is very similar to Night Express Knight, both being trains with a shield wielding figure in front.